Ponyo (or Ponyo on the Cliff by the Sea, as it’s known in Japan) has always been Hayao Miyazaki’s most misunderstood feature. 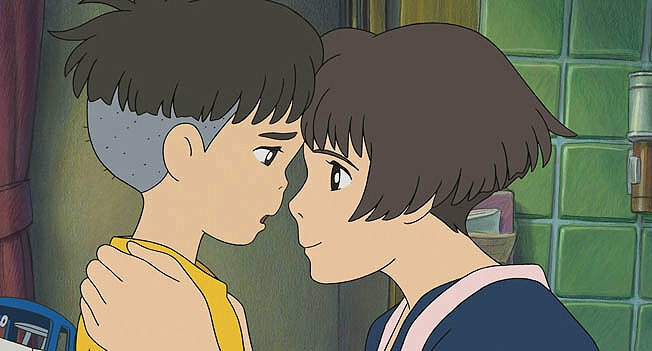 Though it received strong reviews from critics, fans of the famed Japanese animator often referred to it as Miyazaki’s “weakest film,” due to it being aimed at a younger audience (apparently these people forgot that Miyazaki made his name with films like My Neighbor Totoro and Kiki’s Delivery Service). It was even more bizarrely the only Miyazaki-directed feature not to receive a nomination in the Best Animated Feature category at the Academy Awards since that category’s introduction. Ten years later, and Ponyo is only now being more widely recognized for its merits. And while Ponyo may not be as synonymous with Miyazaki’s name in the same way Spirited Away or My Neighbor Totoro are, it is the strongest of the director’s trilogy of ‘post-Spirited Away’ features. 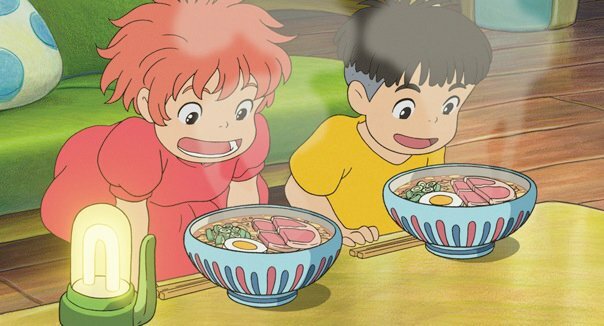 On paper, Ponyo may sound like Hayao Miyazaki’s most straightforward film: it tells the tale of a young boy named Sosuke, who finds a magical goldfish whom he names Ponyo (her ‘real name’ being Brunhilde). 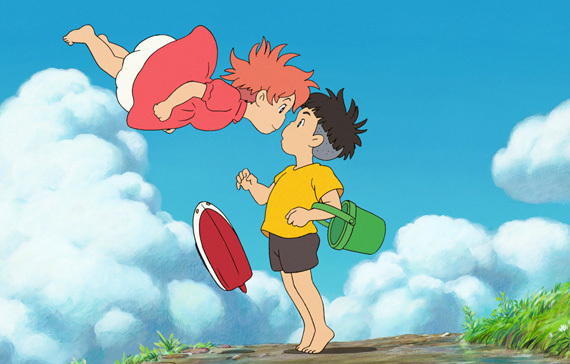 The two form a bond, with Ponyo defying her wizard father Fujimoto and transforming into a human girl to be with Sosuke. A synopsis such as that might imply that Ponyo is simply a Japanese version of The Little Mermaid, but its execution makes it something more complex: Ponyo is described as a goldfish, but has a human-like face and a dress-like tail fin, and she becomes human after tasting Sosuke’s blood (by licking a cut on his finger to heal it) and tampering with one of her father’s magic wells. We also learn that, by becoming human, Ponyo breaks the laws of nature, and her transformation sends reality out of whack. The moon falls closer to Earth, leading the ocean to rise and satellites to fall from the skies, ancient fish come back to life, and tsunamis turn Sosuke’s world upside down. 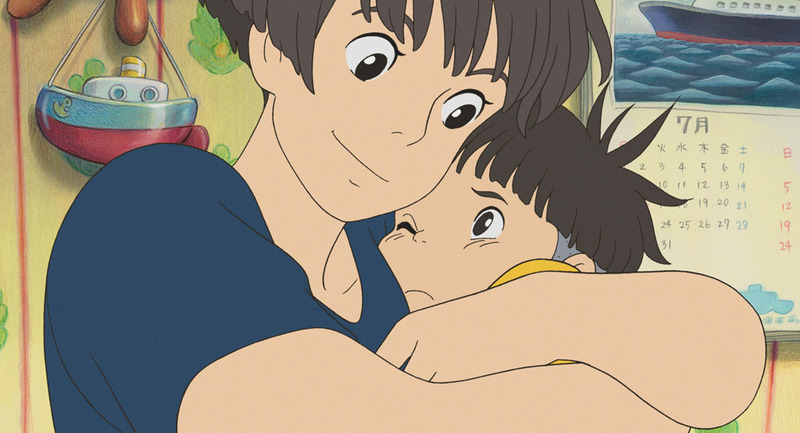 This all leads to a series of adventures between Ponyo, Sosuke, and Sosuke’s mother Lisa. 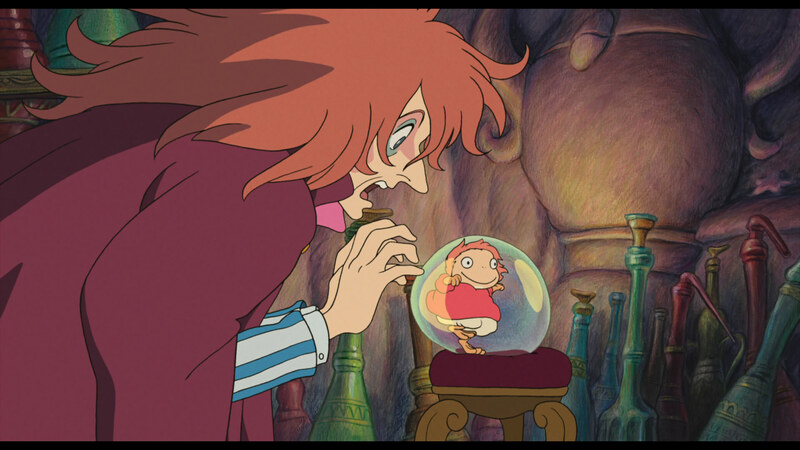 All the while, Fujimoto – the closest thing the film has to an antagonist – tries to separate Ponyo from Sosuke to set things back to the way they were, while Ponyo’s mother, the goddess of the seas, more calmly tries to find a way to fix nature while not interfering with Ponyo and Sosuke’s relationship. It is undoubtedly Miyazaki’s weirdest film, but it’s impossibly charming and sweet, and its imagination is seemingly infinite. While its immediate predecessor Howl’s Moving Castle’s weirdness often came at the expense of a consistently solid narrative, Ponyo’s story benefits from its surrealism and absurdities. Howl featured a strange tonal shift midway through, surrendering its fairy tale plot in favor of an anti-war narrative, ultimately feeling like two different, clashing stories. Meanwhile, Ponyo is a children’s adventure, and is running on “child logic.” As delightfully weird and surreal as Ponyo gets, it all feels like one cohesive whole with its imagination. The weirdness enhances the flow of the story, as opposed to clashing with it in the way Howl did. It’s that childlike wonderment that is Ponyo’s biggest strength. It is impossible not to smile when watching the film. Like Totoro or Kiki’s Delivery Service, there’s a gentleness and sensitivity to Ponyo that’s unique to Miyazaki’s features. While many animated films feature one scene of hustle and bustle after another to hold the attention of younger audiences, Ponyo trusts that children are capable of following a less hectic plot and can appreciate a good story. And though Ponyo’s story is smaller than something like Princess Mononoke, it shares a similar scope to Miyazaki’s more dramatic works, making for an interesting combination of simplicity and complexity. 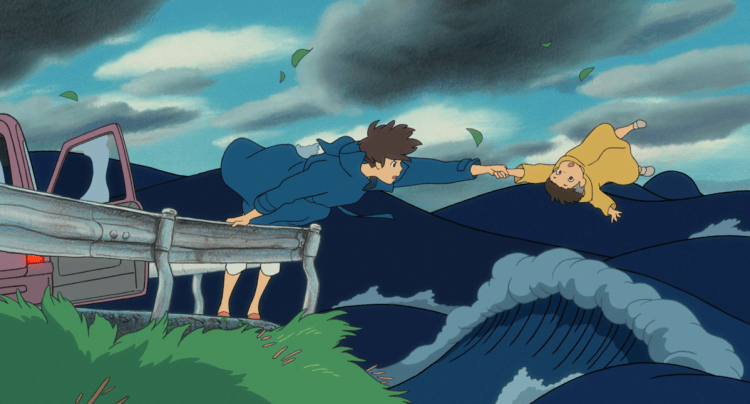 The characters here are among Miyazaki’s most memorable: Ponyo’s naivety makes her as humorous as she is cute, and Sosuke’s determination makes him an easy hero to root for. Lisa is head-strong and independent, and Fujimoto is an eccentric who looks suspiciously like David Bowie. They may not be Miyazaki’s most complex characters (though Fujimoto continues the rich Miyazaki archetype of a “villain who isn’t really a villain”), but they’re possibly his most charming sans Totoro. Speaking of My Neighbor Totoro, that is the comparison people always seem to make with Ponyo and Miyazaki’s older catalogue, since both share a more childlike narrative. And I suppose if there is one area in which Ponyo does fall relatively short, it’s that it doesn’t quite match up to its inevitable comparison. For all its charm and lovability (Ponyo equals Totoro in those departments) it doesn’t match its predecessor’s depth. The drama of Ponyo is almost exclusively fantasy, whereas Totoro’s dilemmas evoke a sense of relatability that is almost unheard of in fantasy films. Still, if the big issue with Ponyo is simply that it isn’t quite as good as arguably Miyazaki’s most cherished film – which it shares elements with – I’d say that doesn’t exactly equate to a major flaw. If Ponyo served as a return to form for Miyazaki after the confused Howl’s Moving Castle, is it really much of a complaint if it isn’t quite Totoro or Spirited Away? While Ponyo may not match the depth of Miyazaki’s best work, it is among the acclaimed director’s most entertaining features. Its utter adorableness should have you smiling from ear to ear, and as mentioned, the weirdness adds a good dose of comedy to the equation, and packs on to the film’s charm. The story unfolds both beautifully and uniquely. Disney was once again responsible for the dubbing, as they had been for most Miyazaki features to this point, and the dub of Ponyo is another winner, perhaps surprisingly so. While Noah Cyrus and Frankie Jonas – younger siblings of Miley Cyrus and the Jonas Brothers – may have seemed like gimmicky casting as Ponyo and Sosuke on Disney’s part (given the dub was released in 2009, when Miley Cyrus and the Jonas Brothers were still a thing), their voices ended up fitting the characters nicely. Tina Fey served as the English voice of Lisa, while Liam Neeson voiced Fujimoto and Cate Blanchett voiced Ponyo’s mother Gran Mamare. Getting such actors not only showed how much care Disney put into the dubbing, but their performances have helped the dub age gracefully. Perhaps the only downside is that the adorable end-credits song has a pop-y remixed second verse, which seems really out of place. Hayao Miyazaki’s films are known for their stunning animation, and Ponyo is certainly no exception. In fact, in many ways, it may be Miyazaki’s most visually ambitious film. There’s a fluidity of movement at play that is close to unrivaled in hand-drawn features. Also of note is that the film seems to occasionally simplify its art direction, while never sacrificing the hard work and effort that went into the animation itself. Ponyo subtly changes its style from time to time, and combined with its settings both on land and the world under the sea, as well as its penchant of characters rapidly changing shapes, Ponyo is an absolute marvel of visuals. Fittingly, it was probably the most impressive hand-drawn animation since Spirited Away. Complimenting these visuals is one of the best musical scores of any Miyazaki feature. Per the norm for the director, Ponyo’s score was composed by Joe Hisaishi, who created one of his strongest soundtracks here. The music of Ponyo captures an ethereal quality similar to that of the visuals, which perfectly compliments the story at play. Ponyo, almost secretly, boasted one of the best musical scores of any animated film of its time. Sadly, that “secret” quality seems to speak for Ponyo as a whole. 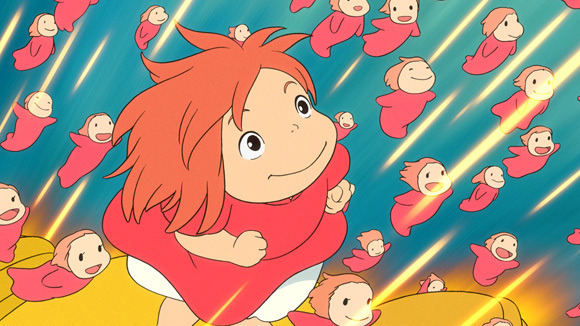 Despite its many merits and acclaim, Ponyo never quite reached the same heights in legacy as many of the Miyazaki-directed films that preceded it. Only now, a decade after its initial release, is Ponyo starting to get its due. Admittedly, Miyazaki’s resume does feature some giants of the animation medium that are hard to live up to, but Ponyo always did live up to that legacy, albeit a bit differently than you’d expect. It may not have attempted the same thematic depth of some of the director’s films, but it was something of an avant garde for animation, presenting a narrative that seems comprised of one idea after another that could only exist in its medium. And it does it all while being as fun and adorable as it can be. Ponyo has lived in the shadows of Miyazaki’s other films for far too long. While it may not be the director’s best work, it has always, in its own way, deserved to sit right alongside them.